You can monitor workflows and tasks in the Workflow Monitor. You can view details about a PowerCenter - Workflows or task in Gantt Chart view or Task view. You can view sessions and workflow log events in the Workflow Monitor Log Viewer. 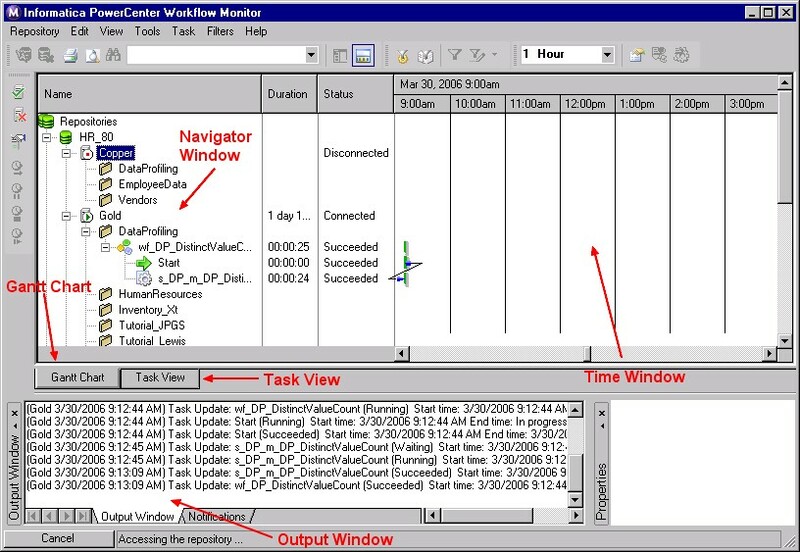 The Workflow Monitor displays workflows that have run at least once. 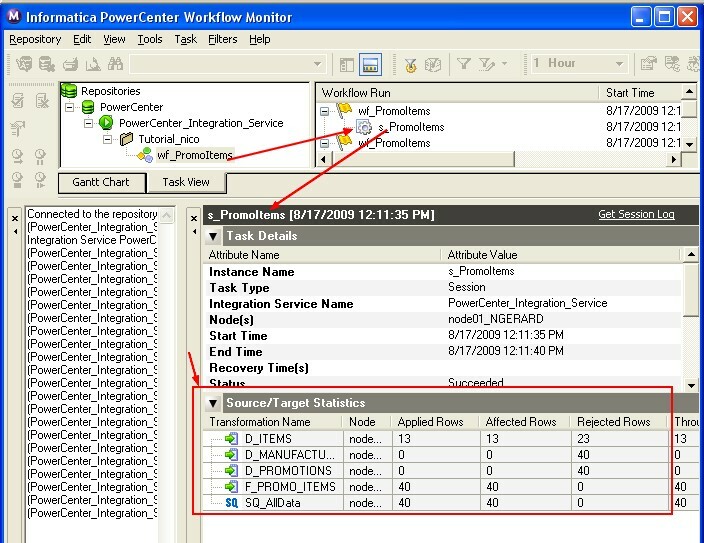 The Workflow Monitor continuously receives information from the PowerCenter - Integration Service and PowerCenter - Repository Service (Process). It also fetches information from the repository to display historic information. Navigator window. Displays monitored repositories, servers, and repositories objects. Output window. Displays messages from the Integration Service and Repository Service. Time window. Displays progress of workflow runs. Gantt Chart view. Displays details about workflow runs in chronological format. Task view. 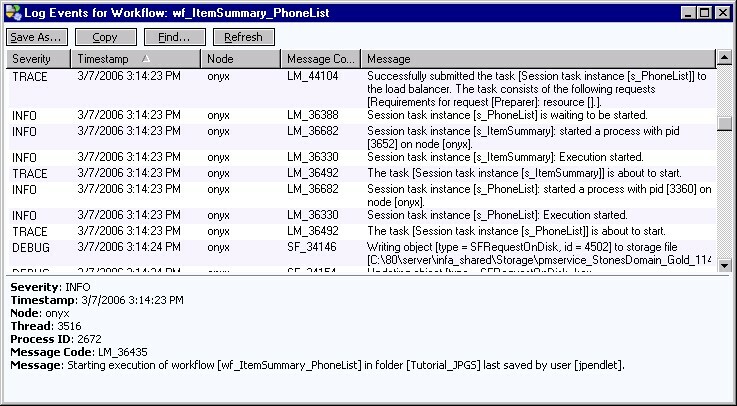 Displays details about workflow runs in a report format. or using the log files. The Log Viewer provides detailed information about each event performed during the workflow run. Right-click the workflow and select Get Workflow Log to view the Log Events window for the workflow. Right-click a session and select Get Session Log to view the Log Events window for the session. When you created the workflow, the Workflow Manager assigned default workflow and session log names and locations on the Properties tab. During the session run, the Integration Service writes the log files to the locations specified in the session properties. In the Properties window, click Session Statistics to view the workflow results. If the Properties window is not open, click View > Properties View. If the Workflow Monitor does not show the current workflow tasks, right-click a folder and select Get Previous Runs. You can click the Task View tab at the bottom of the Time window to view the Workflow Monitor in Task view. You can switch back and forth between views at any time.